The absorption of GHG emissions by forests and green lands, which serves as an important storage of CO2, has been included in the Paris Agreement, due to the active role of the Polish delegation supported by others. It will also prevent the increase of GHG emissions caused by deforestation in some EU countries, such as Denmark, Ireland and the Netherlands. The situation in such countries as Germany, Austria, Estonia and Latvia should be discussed as well. We need our Europe to be greener. The role of conservation, the sustainable management of forest, and enhancement of forest carbon stock, should concern not only EU Member States, but developing counties with rain forests, as well. To reach the goal of the Paris Agreement, we need an urgent directive, which will introduce the possibility of acknowledging forests as a natural CO2 storage, with the same results as CCS or CCU concepts. As we all know, the EU already reached in 2013, its 20% CO2 decrease target aimed for 2020. The result is 21%. To better understand the impact of forest “storage”, we prepared a graph showing the EU’s CO2 decrease, according to existing regulations, compared to the forest “storage” factor. If this factor had been included into the EU regulations, the total decrease of CO2 would have been 23%, instead of the existing 21%. 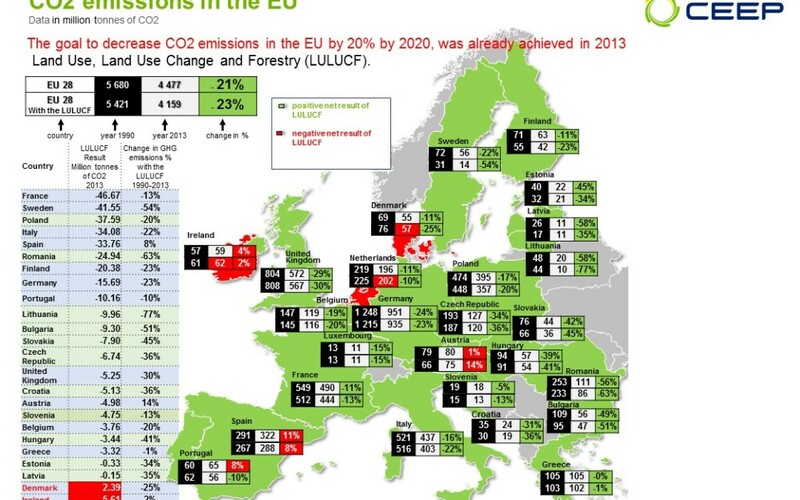 Maybe this does not seem to be a big difference, but the forest “storage” factor will be a great instrument concerning CO2 decreases, and inevitably, will stimulate Europe to be more green, which we should encourage. Jarosław Cendrowski, Coordinator, Grupa LOTOS S.A.